In addition to entertaining us Arabs with his antics and word games for decades, Gaddafi can be credited with turning everyone from the milkman to the news presenter into a diagnostician of mental illness. Words such as ‘nutter’ and ‘madman’ became ‘delusional’ and ‘psychotic’ in the hands of those more sophisticated twitter crowds. The consensus being that the dictator of Libya for the past 40 years is indeed clinically insane. And there lies the problem. This ‘madman’ has been ruling a country of 6 million inhabitants with an iron grip, has managed to fund every single revolutionary movement and subversive outfit throughout the 70s and 80s (From the Abu Nidal group to the Basque ETA passing by the Irish Republican Army), has charmed 2 US presidents and challenged many more while finally turning friend of the West in the trade deal of the Century. And what does that say about us then, the rest of humanity, blessed by sanity and mental equilibrium but until 2 weeks ago bending backward to accomodate the Libyan ruling clan's outrageous behaviour. Few have actually attempted to, publicly at least, get to the bottom of Gaddafi’s modus operandi. I suspect that much more of that effort is being done behind closed doors within intelligence agencies where psychological analysis if foreign dignitaries is a routine exercise. Nonetheless, I have my doubts over how successful Western experts have been at studying human psychology outside a narrow Western context. Indeed one former UK ambassador urged analysts to view Gaddafi’s speeches from the angle of his target audience: His supporters and foes on Libyan soil, which he respectively attempts to embolden and terrorise. Using direct, unconditional street language might look strange to a Washington official but not to a militiaman in Green Square. On one hand Gaddafi’s eccentricity is not in contention and independent of any cultural relativism. The man is capricious and unpredictable. But these are personality traits common to many and not signs of madness, at least not the type that diminishes one’s executive functioning and ability to skilfully manipulate and lead. The difference between Gaddafi and the common man is that he is able (and enabled by others) to live his fantasies in a very public manner and on a scale that impacts on the Libyan people and on the international scene. 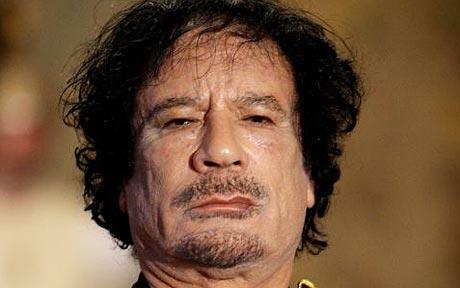 We have to remind ourselves that this man of humble background reached absolute power aged 27, faced little opposition from the start and is granted the status of patron of an international revolutionary movement for decades Based on what I have seen and heard so far, I suspect Gaddafi is neither psychotic nor on drugs (Interesting that he uses the same accusation for the rebels opposing him). His smile to Jeremy Bowen as he unashamedly declares that the Libyan people loved him is similar tactical posturing to his son’s tongue-in-cheek comment that Libya was ‘the most democratic country in the world’ which earned him laughs and applause at the LSE. The way to read Gaddafi is to remember that absolute monarchs/leaders have always behaved irrationally/emotionally the way we all do sometime. In the absence of any systems of checks and balances the people find themselves at the receiving end of such behaviour. World history is littered of such figures from Alexander the Great to the Roman emperors and medieval Kings to modern day autocrats. Unfortunately for us, the Colonel is an all too common 20th century dictator with a superficial penchant for theatricality. Dismissing him as an ineffective ‘nutcase’ is simply an insult to the Libyan people shedding blood and tears to oust him from power. I do agree with you Joseph. Dismissing Gaddafi as a nut case is an easy way out for Western powers to ignore their own responsibilities (not to say complicity) in maintaining the dictator in place and making profitable business deals with him. How convenient for Washington, London, Paris and Rome to talk about their former new BFF as a madman. Have they been taking advantage of his "mental illness" then? Have they ripped off the Libyan people of its natural resources by signing deals with a president weakened by "psychopathy"? What sort of mental illness are these democracies affected with? My guess is the oilandgas disease coupled with greedopathy.